The low-alloy high-strength steels represent the bulk of the remaining steels in the AISI designation system. These steels are welded with E-80XX, E-90XX, and E-100XX class of covered welding electrodes. It is also for these types of steels that the suffix to the electrode classification number is used.This article gives you information about welding of low-carbon steels and low-alloy steels, welding of medium-carbon steels, welding high-carbon steels, welding low-nickel chrome steels, welding low-manganese steels, welding low-alloy chromium steels. Almost 85% of the metal produced and used is steel. The term steel encompasses many types of metals made principally of iron. Steel is an alloy of iron and carbon, but steels most often contain other metals such as manganese, chromium, nickel, etc., and nonmetals such as carbon, silicon, phosphorus, sulfur, and others. There are so many different types and kinds of steels that it is sometimes confusing just to be able to identify the steel that is being used. For example, there are structural steels, cast steels, stainless steels, tool steels, hot rolled steel, reinforcing, steel, low alloy high strength steel, etc. Steels are sometimes given names based on their principal alloy such as carbon steel, chrome-manganese steel, chrome-molybdenum steel, etc. Low-carbon steels include those in the AISI series C-1008 to C-1025. Carbon ranges from 0.10 to 0.25%, manganese ranges from 0.25 to 1.5%, phosphorous is 0.4% maximum, and sulfur is 0.5% maximum. Steels in this range are most widely used for industrial fabrication and construction. These steels can be easily welded with any of the arc, gas, and resistance welding processes. The low-alloy high-strength steels represent the bulk of the remaining steels in the AISI designation system. These steels are welded with E-80XX, E-90XX, and E-100XX class of covered welding electrodes. It is also for these types of steels that the suffix to the electrode classification number is used. These steels include the low-manganese steels, the low-to-medium nickel steels, the low nickel-chromium steels, the molybdenum steels, the chromium-molybdenum steels, and the nickel-chromium-molybdenum steels. 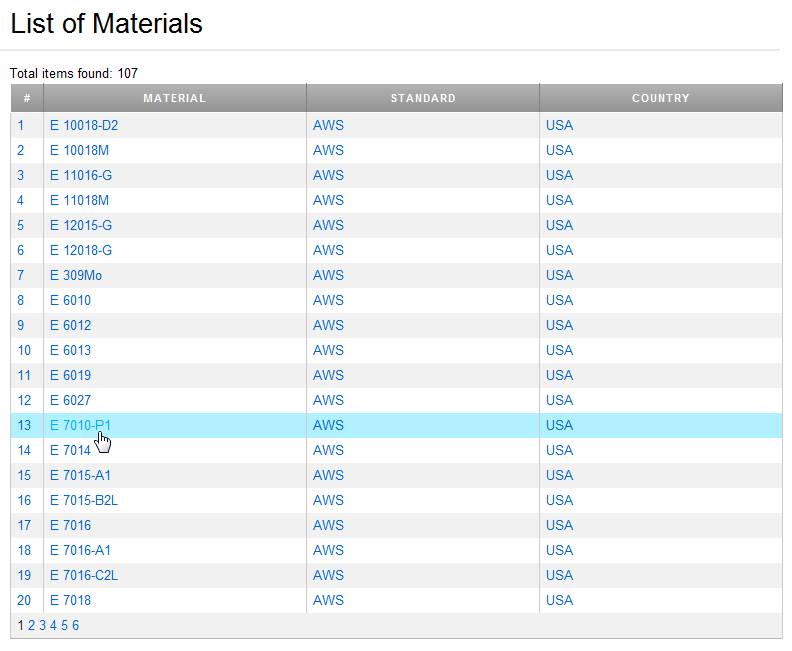 These alloys are included in AISI series 2315, 2515, and 2517. Carbon ranges from 0.12-0.30%, manganese from 0.40-0.60%, silicon from 0.20-0.45% and nickel from 3.25-5.25%. 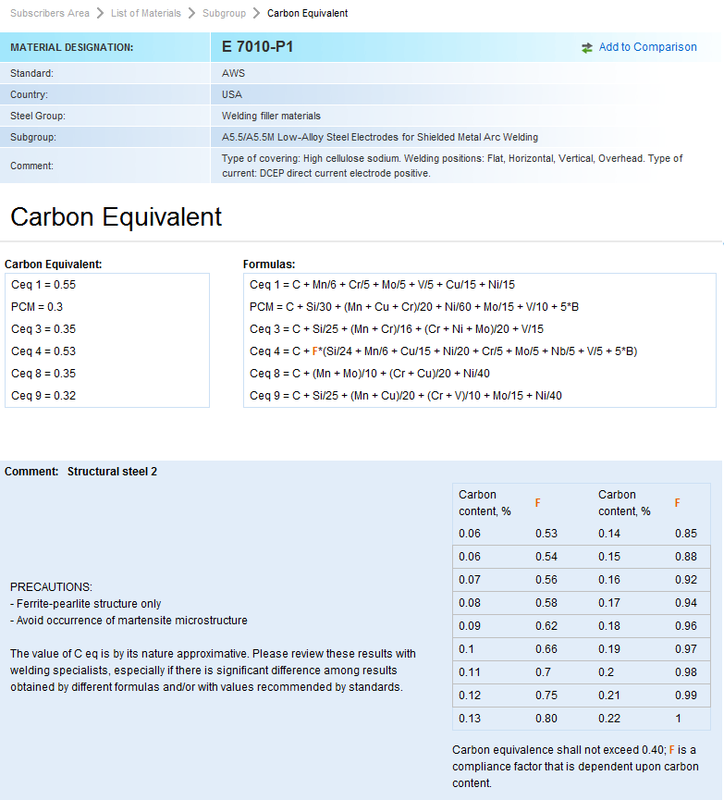 If the carbon does not exceed 0.15% preheat is not necessary, except for extremely heavy sections. If the carbon exceeds 0.15% preheat of up to 260oC, depending on thickness is required. For the shielded metal arc welding process, attention was directed toward the selection of the class of covered electrodes based on their usability factors. All the electrodes described in AWS specification A5.1 are applicable to the mild and low-alloy steels. The E-60XX and E-70XX classes of electrodes provide sufficient strength to produce 100% weld joints in the steels. The yield strength of electrodes, in these classes, will overmatch the yield strength of the mild and low alloy steels. The E-60XX class should be used for steels having yield strength below 350 MPa and the E-70XX class should be used for welding steels having yield strength below 420 MPa. Low-hydrogen electrodes should be used and preheat is suggested when welding heavier materials, or restrained joints. The electrode that provides the desired operational features should be selected. When welding the low-alloy high-strength steels, the operating characteristics of the electrode are not considered since the E-80XX and higher-strength electrodes are all of the low-hydrogen type. There is one exception, which is the E-XX10 class. These are shown in the AWS specification for low-alloy steel-covered arc welding electrodes, AWS 5.5. This specification is more complex than the one for mild steel electrodes, even though there are only two basic classes in each strength level. The lower strength level includes the E-8010, E-XX15, E-XX16, and the more popular E-XX18 classes. This new information now allows the selection of the covered electrode to match not only the mechanical properties of the base metal, but also to approximately match the composition of the base metal. From this reason, the base metal composition and the mechanical properties must be know in order to select the correct covered electrode to be used. The only E-80XX or higher-strength electrodes that do not have low-hydrogen coverings are the E-8010 type electrodes which are designed specifically for welding pipes. These high strength, cellulose-covered, electrodes are matched to specific alloy of the steel pipes. The deep penetrating characteristics of the cellulose-covered electrodes make them suitable for cross-country pipe welding. The theory and practice is that alloy steel pipe is relatively thin and it is welded with cellulose-covered electrodes at relatively high currents. In addition, each welding pass is very thin and the weld metal is aged for a considerable length of time prior to putting the pipeline into service. This allows for hydrogen, which might be absorbed, to escape from the metal and not adversely affect the service life of the pipeline. The medium-carbon steels include those in the AISI series C-1020 to C-1050. The composition is similar to low-carbon steels, except that the carbon ranges from 0.25 to 0.50% and manganese from 0.60 to 1.65%. With higher carbon and manganese the low-hydrogen type electrodes are recommended, particularly in thicker sections. Preheating may be required and should range from 150-260oC. Postheating is often specified to relieve stress and help stress and help reduce hardness that may have been caused by rapid cooling. Medium-carbon steels are readily weldable provided the above precautions are observed. These steels can be welded with all of the processes mentioned above. High-carbon steels include those in the AISI series from C-1050 to C-1095. The composition is similar to medium-carbon steels, except that carbon ranges from 0.30 to 1.00%. Special precautions must be taken when welding steels in these classes. The low-hydrogen electrodes must be employed and preheating of from 300-320oC is necessary, especially when heavier sections are welded. A postheat treatment, either stress relieving or annealing, is usually specified. High-carbon steels can be welded with the same processes mentioned previously. Steels in this group include the AISI 3120, 3135, 3140, 3310, and 3316. In these steels, carbon ranges from 0.14-0.34%, manganese from 0.40-0.90%, silicon from 0.20-0.35%, nickel from 1.10-3.75% and chromium from 0.55-0.75%. Thin sections of these steels in the lower carbon ranges can be welded without preheat. A preheat of 100-150oC is necessary for carbon in the 0.20% range, and for higher carbon content a preheat of up 320oC should be used. The weldment must be stress relived or annealed after welding. Included in this group are the AISI type 1320, 1330, 1335, 1340, and 1345 designations. In these steels, the carbon ranges from 0.18-0.48%, manganese from 1.60-1.90%, and silicon from 0.20-0.35%. Preheat is not required at the low range of carbon and manganese. Preheat of 120-150oC is desirable as the carbon approaches 0.25%, and mandatory at the higher range of manganese. Thicker sections should be preheated to double the above figure. A stress relief postheat treatment is recommended. Included in this group are the AISI type 5015 to 5160 and the electric furnace steels 50100, 51100, and 52100. In these steels carbon ranges from 0.12-1.10%, manganese from 0.30-1.00%, chromium from 0.20-1.60%, and silicon from 0.20-0.30%. When carbon is at low end of the range, these steels can be welded without special precautions. As the carbon increases and as the chromium increases, high hardenability results and a preheat of as high 400oC will be required, particularly for heavy sections. When using the submerged arc welding process, it is also necessary to match the composition of the electrode with the composition of the base metal. A flux that neither detracts nor adds elements to the weld metal should be used. In general, preheat can be reduced for submerged arc welding because of the higher heat input and slower cooling rates involved. To make sure that the submerged arc deposit is low hydrogen, the flux must be dry and the electrode and base metal must be clean. When using the gas metal arc welding process, the electrode should be selected to match the base metal and the shielding gas should be selected to avoid excessive oxidation of the weld metal. Preheating with the gas metal arc welding (GMAW) process should be in the same order as with shielded metal arc welding (SMAW) since the heat input is similar. When using the flux-cored arc welding process, the deposited weld metal produced by the flux-cored electrode should match the base metal being welded. Preheat requirements would be similar to gas metal arc welding. When low-alloy high-strength steels are welded to lower-strength grades the electrode should be selected to match the strength of the lower-strength steel. The welding procedure, that is, preheat input, etc., should be suitable for the higher-strength steel. Total Materia는 용접용으로 적합한 다양한 국가와 규격 내 수천개의 재질에 대한 정보를 포함하고 있습니다. 재질의 화학적 조성, 기계적 특성, 물리적 특성, 탄소 등가 데이터와 용접용으로 재질 이용 시 필요한 정보 등의 전체적인 특성 정보들을 어디서든 검토하실 수 있습니다. 고급 검색을 이용하여, 검색 조건의 재질 리스트에서 '용접 필러 재료'를 선택합니다. 검색 범위 좀 더 줄이기를 원하신다면 국가/규격과 같은 다른 조건을 지정할 수 있습니다.